While Detroit Lions coach Jim Schwartz’s job appears safe, the Lions let go three assistant coaches on Monday according to reports. Gone are wide receivers coach Shawn Jefferson, running backs coach Sam Gash and offensive line coach George Yarno. All three had contracts that were expiring. Jefferson spent eight seasons as a coach with the Lions after playing for them in the 2003 season. He spent 13 years playing in the NFL. He was in two Super Bowls — one with the Chargers and one with the Patriots. 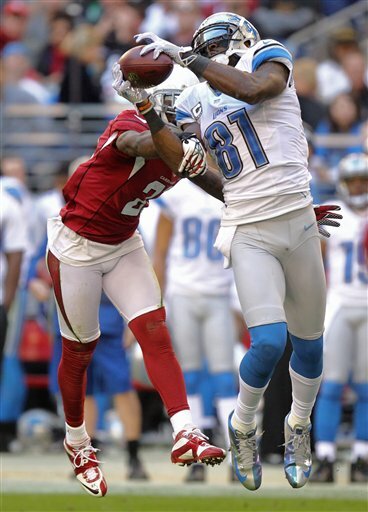 Last week Calvin Johnson credited Jefferson with his development as an elite NFL wide receiver. Jefferson started his Lions coaching career as a coaching intern in 2005. Gash served as running backs coach for five seasons after getting a start with the Lions as assistant special teams coach in 2007. Yarno was the offensive line coach for four seasons. He was brought in when Scott Linehan was named offensive coordinator. Monday was the first day of evaluations following the 4-12 season. A possibility remains that more coaching staff moves could be made. DETROIT — Detroit Lions coach Jim Schwartz led the Lions to a disappointing 4-11 season with one more chance at a fifth win today against the Chicago Bears. In his four seasons with the Lions, Schwartz is 22-41 after taking over an 0-16 team. He’s had one winning season when they finished 10-6 in 2011. Today there are conflicting reports on his job status for next season. ESPN’s Chris Mortensen reported on Sunday that the Ford family has discussed buying out Schwartz’s contract and moving on. Reportedly they are unhappy with the culture of the team. Jason LaCanfora, the insider for CBSSports.com, reports that Schwartz is safe as does ProFootballTalk.com. Schwartz signed a contract extension before the season through 2015. A week ago, Adam Schefter reported that Schwartz is safe. The Ford family has a long history of loyalty to general managers and coaches. It’d be surprising to see them give up on schwartz or general manager Martin Mayhew. Expect they will both get another season to turn situation around. DETROIT — Tight end Brandon Pettigrew will start today for the Detroit Lions against the Chicago Bears after missing two games with an ankle injury. Pettigrew practiced on a limited basis on Friday. It was his first practice since he injured his ankle at Green Bay on Dec. 9. Andre Fluellen will start at defensive tackle in place of defensive tackle Sammie Hill (toe) was listed as out on Friday’s injury report and was placed on injured reserve on Saturday. Defensive tackle Jimmy Saddler-McQueen was signed from the practice squad. Wide receiver Calvin Johnson (knee/ankle, cornerback Chris Houston (hamstring/hip) and running back Kevin Smith (thumb) were limited in Friday’s practice and listed as probable for the game. Smith is out, but Johnson and Houston will play. Other inactives are: Kellen Moore, Ricardo Silva, Jason Fox, Corey Hilliard and Ronnell Lewis. For the Bears, safety Chris Conte (hamstring) and linebacker Blake Costanzo (calf) were listed as out on Friday. Linebacker Brian Urlacher (hamstring) is inactive along with Josh McCown, Armando Allen, Corey Brandon and Nate Collins. Five things the Detroit Lions (4-11) must do to beat the Chicago Bears (9-6) on Sunday at Ford Field. Kickoff is 1 p.m.
1. Get the ball to Calvin Johnson. Seriously. In the first match-up on Oct. 22 at Soldier Field, Johnson had just three catches for 34 yards, his lowest production this season. If the Lions are going to win, Johnson needs to have a big day because his supporting cast has drastically changed in the last two months. Johnson needs 108 yards to reach the magical 2,000-yard mark. With 104 yards he can become the most productive receiver on a per-game basis in a season. 2. In their first meeting when the Bears won 13-7, the Lions defense sacked Jay Cutler five times and had nine quarterback hits. The Bears’ offensive line is no better, so taking advantage of the weak area is key for the Lions front four who had three of the five sacks on Oct. 22. Cliff Avril, who had one of the sacks, was surprised to hear this statistic, but it’s a fact and they need to do it again to have a chance. 3. Even though the Lions are 4-11 and not going anywhere but home next week, they need the fans’ help to make Ford Field too loud for the Bears to hear. Remember that 24-13 Monday night win over Chicago in 2011 (seems much longer ago, doesn’t it), Detroit fans were serious and caused nine false starts. Of course they had much more to cheer for then. With that win the Lions started the season 5-0. Now they’re trying to snap a seven-game losing streak. 4. Hold onto the ball. The Lions fumbled six times, losing three in the first match-up this year at Chicago. Two of the lost fumbles were in the red zone. Need I say more? It was rainy, but the Bears had zero fumbles. The Bears defense is excellent at stripping the ball away. It’s not an accident they swarm the ball on every play. 5. Play like it’s the first game of the season, not the 16th. Defensive tackle Sammie Hill (toe) has been ruled out for Sunday’s game against the Chicago Bears. He hasn’t practiced all week which leaves the Lions slim at the defensive tackle position with Corey Williams and Nick Fairley on injured reserve. Andre Fluellen is likely to get the start. Fluellen was cut after training camp and then re-signed on Dec. 12 after Williams was placed on injured reserve. Tight end Brandon Pettigrew returned to practice Friday for the first time since he sprained his ankle at Green Bay on Dec. 9. It was on a limited basis. He has missed the last two games and is doubtful for Sunday. Safety Louis Delmas (knee) returned to practice after sitting out all week. He’s done this for the last two weeks which allowed him to play. He’s questionable against the Bears. Chris Houston (hamstring/hip) was limited on Friday and is also questionable. Calvin Johnson (knee/ankle) did not practice, but was on the field. He’s probable to play on Sunday. Defensive end Kyle Vanden Bosch, who didn’t practice, has been taking rest days on Fridays. For the Bears, safety Chris Conte (hamstring) and linebacker Blake Costanzo (calf) are out while linebacker Brian Urlacher (hamstring) is doubtful; running back Armando Allen (knee) and defensive tackle Henry Melton (chest) are questionable. ALLEN PARK — Tight end Brandon Pettigrew returned to practice today (Friday) for the first time since he sprained his ankle at Green Bay on Dec. 9. It appeared to be on a limited basis. He has missed the last two games. Safety Louis Delmas (knee) also practiced on a limited basis after sitting out all week. He’s done this for the last two weeks which allowed him to play. Calvin Johnson (knee/ankle) did not practice but was on the field. He’s expected to play on Sunday against Chicago Bears. Defensive tackle Sammie Hill (toe) remained out. He hasn’t practiced all week which leaves the Lions slim at the defensive tackle position. If Hill can’t go, Andre Fluellen is likely to get the start. Fluellen was cut after training camp and then re-signed on Dec. 12 after Corey Williams was placed on injured reserve. The Lions (4-11) are looking to snap their seven-game losing streak while the Bears (9-6) need a win and a Minnesota Vikings loss or tie to get into the playoffs. Kickoff is at 1 p.m. at Ford Field with coverage on Fox. 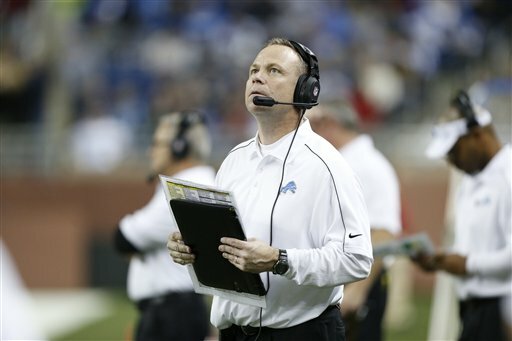 ALLEN PARK — With a 4-11 record, it seems likely the Detroit Lions coaching staff will undergo changes at the end of the season. Coach Jim Schwartz will keep his job and it appears offensive coordinator Scott Linehan is safe after Schwartz spoke glowingly about him on Thursday. “I think (Linehan has) done a great job. Again, I think particularly the ball security stuff. An offensive coordinator’s job is to put guys in position to make plays and I think over the course of the season we’ve been in good position to make plays,’’ Schwartz said. Schwartz brought Linehan in as coordinator when he was first hired four seasons ago. ALLEN PARK — Stefan Logan will not have a chance to redeem himself after taking a knee at the four-yard line on a free kick after a safety late in Saturday night’s loss to the Atlanta Falcons. Logan said on Thursday he will not be returning kicks or punts on Sunday against the Chicago Bears. When Logan took the knee he thought he was in the end zone. He got lost on the field and coach Jim Schwartz said it’s a return man’s job to know exactly where he is on the field. Expect to see wide receiver Mike Thomas with the return assignment. Logan, who becomes a free agent after the season, won’t get another chance at least this week. “At the same time being on special teams with the new rules, you don’t get that many opportunities so when you get your opportunities you have to make the best of them,’’ Logan said. “I did make some plays on offense, I got a couple catches. I’m just adding to my resume and keep moving forward with Detroit or with another team. “I can’t do nothing about that, I have to keep working. Hopefully I’m here, I’ve been here three years now, I want to continue to be with my team, continue to be with my boys and the coaching staff. We’ll see what happens after this game or in my future,’’ Logan added. Offensively Logan has six catches for 28 yards and three rushes for 17 yards this season. With the wide receiving group hit hard by injuries, Logan has had more of a chance to play on offense. ALLEN PARK — Calvin Johnson returned to practice today (Thursday) after sitting out on Wednesday. The Detroit Lions wide receiver, who was named to the Pro Bowl on Wednesday night, was listed on the injury report with knee/ankle. He’s been dealing with a lingering knee injury most of the season. 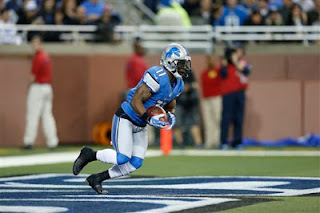 Johnson set the NFL single season receiving yards record on Saturday night. He needs 108 yards on Sunday to reach 2,000 receiving yards for the season. Still missing from practice were tight end Brandon Pettigrew who hasn’t played or practiced since spraining his ankle on Dec. 9 at Green Bay; Louis Delmas who misses most practices due to a knee injury and defensive tackle Sammie Hill (toe) who started the last two games. The Lions (4-11) are preparing to play the Chicago Bears who need a win combined with a tie or loss by the Minnesota Vikings to make it to the playoffs. The Bears (9-6) started the season 7-1, but have lost five of the last seven. ALLEN PARK — Calvin Johnson was among four Detroit Lions who didn’t practice on Wednesday in preparation to play the Chicago Bears on Sunday. Johnson, who broke Jerry Rice’s single season receiving yards record on Saturday night, has been dealing with a knee injury for most of the season. He’s missed plenty of practices but no games. Also missing were safety Louis Delmas (knee), who started the last two games; Sammie Hill who has started the last two games in place of Nick Fairley who was placed on injured reserve; and tight end Brandon Pettigrew who has not played since he sprained his ankle on Dec. 9 at Green Bay. Kenny Albert and Tony Siragusa will call the game on FOX with a 1 p.m kickoff. The Bears are favored by three points per America’s Line. The NFL will announce the Pro Bowl rosters at 7 p.m. on the NFL Network in a special edition of Total Access. DETROIT — Detroit Lions tight end Brandon Pettigrew will miss his second straight game with a sprained left ankle. Pettigrew sustained the injury two weeks ago at Green Bay and has not practiced or played since then. The offense has missed his presence. Will Heller will start in place of Pettigrew. Free safety Louis Delmas will start for the second straight game. Delmas, who has a lingering knee injury, practiced on a limited basis on Thursday and said he planned to play. He was listed as questionable on the Friday injury report. Other inactives for the Lions are: Ron Bartell, Ogembi Nwagbuo, Ronnell Lewis, Jason Fox, Corey Hilliard and Kellen Moore. Inactives for the Falcons are: Dominique Davis, Tim Toone (former Lions WR), William Moore, Phillipkeith Manley, Harland Gunn, Chase Coffman and Cliff Matthew. 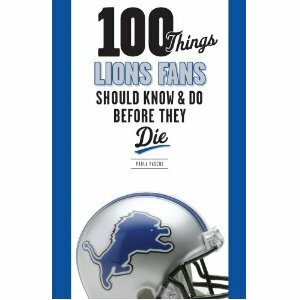 I will be signing copies of my book, "100 Things Lions Fans Should Know & Do Before They Die" from 9 a.m. to 1 p.m. on Saturday, Dec. 22, at The Peppermill Cafe. The book is $14.95 and makes a great Christmas present, especially when it’s personalized. Buy a book and get 25 percent off your meal. The Peppermill cooks up great omelets and they’re known for their eggs Benedict. They also feature amazing salads, sandwiches and homemade potato chips. The Peppermill Cafe is located at 2407 Elizabeth Lake Rd., Waterford. Calvin Johnson is in this for the long haul after signing an eight-year, $150.5 million deal last spring. That signing came after the Detroit Lions’ wide receiver’s first trip to the playoffs. Now the Lions are 4-10 with home games against the Atlanta Falcons and Chicago Bears to wrap up the season. Johnson needs just 182 yards in those two games to break Jerry Rice’s single-season receiving yards record. Johnson, who is signed through 2019, seems to think this season was more of an aberration. If he’s discouraged looking ahead to next season, he is not letting on. Down to two games in the season and it doesn’t get easier for the Detroit Lions (4-10). Here are five things the Lions need to do to beat the Atlanta Falcons (12-2) at Ford Field on Saturday night. Kickoff is 8:30 p.m.
1. Open up more options on offense. Easier said than done with the newer wide receivers just getting used to the offense. Calvin Johnson is always the go-to guy but it’s tough when he is double- and triple-covered. 2. Play with intensity for 60 minutes or whatever it takes. Ford Field will be sold-out which should fire up the home team. If it doesn’t, something is seriously wrong. Basically this is a Monday Night Football game on Saturday night. Same hoopla. A national TV audience will be watching. 3. Matthew Stafford must play better. The 38-10 loss was not all on him, but he did not play well. 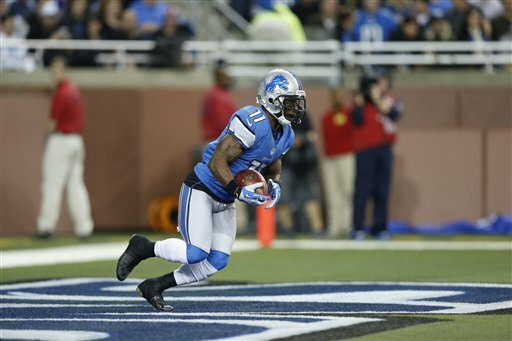 It’s tough missing Nate Burleson, Ryan Broyles and Titus Young, but he has to step up. After throwing three interceptions Sunday, it doesn’t get easier. The Falcons defense has 18 interceptions so far including 10 from Drew Brees, Peyton Manning and Eli Manning combined. The Falcons have held opponents without a passing touchdown in four of its last five games. 4. Don’t give Falcons quarterback Matt Ryan time. The defensive line must apply pressure early and often. Ryan has thrown 27 touchdown passes with just 14 interceptions and has a 97.5 quarterback rating. 5. The secondary must come together and play mistake-free. Louis Delmas said he’ll play which adds a spark. He’ll likely be alongside Don Carey. Chris Houston will face his old team, the Falcons, likely with Jonte Green also starting at cornerback now that Jacob Lacey is gone for the final two games. Prediction: Falcons 28, Lions 24. ALLEN PARK — Brandon Pettigrew is highly unlikely to play on Saturday night against the Atlanta Falcons. The Detroit Lions tight end was not at practice today (Thursday) and has not practiced since he injured his ankle in the loss at Green Bay two weeks ago. Safety Louis Delmas (knee) returned to practice after sitting out on Wednesday. It was likely on a limited basis. He had the same routine last week and still played in 89 percent of the defensive snaps in the loss at Arizona. Calvin Johnson (knee), Mikel Leshoure (calf) and DeAndre Levy (ankle) were limited in Wednesday’s practice. All three were on the field for the portion of practice open to the media. All three are fully expected to play on Saturday night at Ford Field. 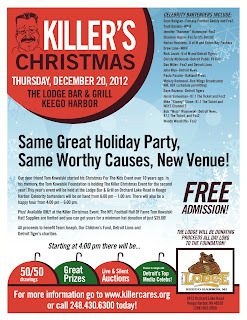 Former Lions beat writer Tom Kowalski, who died suddenly on Aug. 29, 2011, will be remembered at Killer’s Christmas party on Thursday (Dec. 20) at The Lodge in Keego Harbor. Kowalski started the tradition of a Christmas party to raise money for kids at Christmas several years ago and his friends are keeping the tradition alive to benefit the Tom Kowalski Foundation. Charities that will benefit include Team Joseph, a foundation created to raise money for research for Duchenne Muscular Dystrophy, and Our Children’s Fund which helps ensure that every student in West Bloomfield Schools is able to participate in academic and enrichment activities. Memorabilia from the Detroit Lions and Pistons will be auctioned. 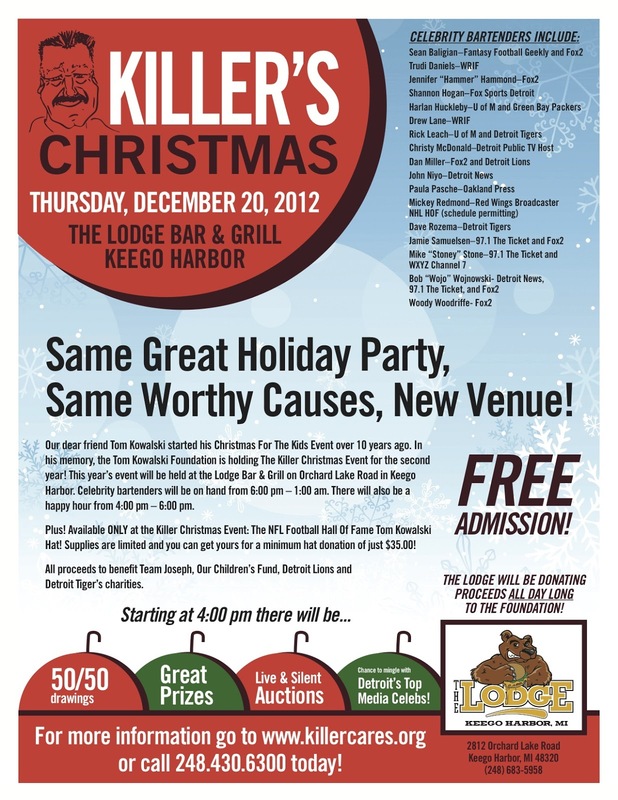 Celebrity bartenders will be on hand to serve. Admission is free. Happy hour is 4-6 p.m. It will run until closing. ALLEN PARK — Defensive tackle Nick Fairley was placed on injured reserve on Wednesday to end his season. Fairley injured his shoulder at Green Bay and did not play at Arizona. He finished the season with 5.5 sacks and 35 tackles in 13 games. The Lions signed 26-year-old defensive tackle Ogemdi Nwagbuo, a former Michigan State Spartan. He has played in 35 games with the San Diego Chargers, who signed his as undrafted free agent in 2008, and the Carolina Panthers. 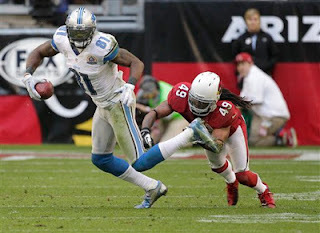 At Wednesday’s practice, tight end Brandon Pettigrew (ankle) and Louis Delmas (knee) did not practice. The Lions (4-10) are preparing to play the Atlanta Falcons (12-2) on Saturday night. Kickoff is at 8:30 p.m. for the nationally televised game which replaces Monday Night Football. ALLEN PARK — Cornerback Jacob Lacey became the Detroit Lions’ fourth defensive back to be placed on injured reserve when the Lions made the move on Tuesday. Lacey’s knee cap popped out — a knee subluxation — early in Sunday’s loss at Arizona. It popped back in, but he couldn’t get back up to speed. Coach Jim Schwartz said it won’t require surgery. Lacey joins rookie cornerback Bill Bentley and Chris Greenwood, along with safety Amari Spievey. To fill his spot on the roster, the Lions signed veteran cornerback Ron Bartell who was cut by the Oakland Raiders on Dec. 10. Bartell, a Detroit native, attended Detroit Renaissance and played at Howard University. The Lions (4-10) play the Atlanta Falcons (12-2) on Saturday night at Ford Field. Kickoff is 8:30 p.m. It’s a nationally televised game — Monday night football on Saturday. ALLEN PARK — It made sense that the Detroit Lions defensive line should dominate the Arizona Cardinals’ makeshift offensive line. After all the D-line is the heart of the Lions defense. And the Cardinals’ quarterbacks had been sacked 51 times in the first 13 games. Schwartz defended the line and the defense on Monday, following the 38-10 loss on Sunday night. “I mean, we can certainly play better and we want to but, you know, there were a couple rushes when the quarterback escaped. One, he found a receiver for one of the only two first downs or third down conversions in the game. Another, he scrambled for a first down. So, we can do those better. The line was missing Nick Fairley who was out with a shoulder injury. They lost Corey Williams for the season a few weeks ago. 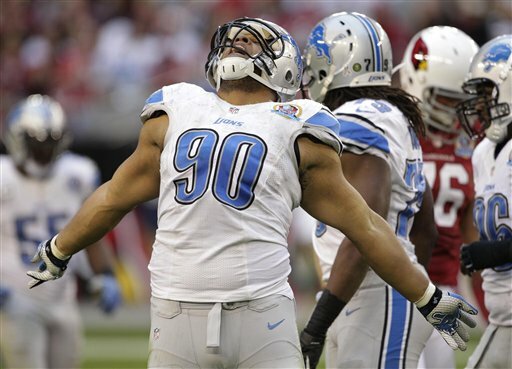 Defensive tackle Ndamukong Suh had the lone sack and that was late in the game. Suh also had four quarterback hits, the only other defensive lineman credited for a quarterback hit was Willie Young. 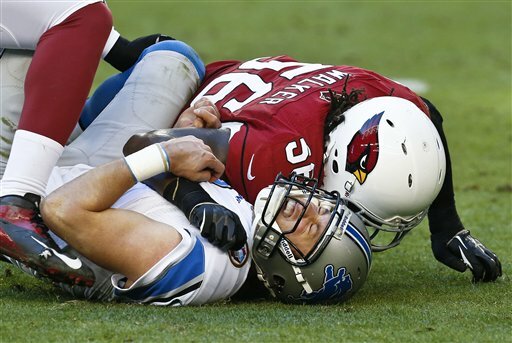 The 38-10 thumping of the Lions by the Arizona Cardinals was certainly a surprise. It was certainly not a certainty that the Lions would win, but like all their games this season it should have been close. Until Sunday night in Phoenix, the biggest loss had been by 10 points to the Vikings at Minnesota. After the game coach Jim Schwartz and Matthew Stafford said that the team had not quit. If that’s true, it’s a good sign. Everything else seems to be in shambles. Much of it is due to injury. Every team has injuries and must get by. 1. Matthew Stafford did not have a good day. He threw three interceptions and the Cardinals capitalized on all three. He has to be better. In his defense, other than Calvin Johnson he’s throwing to receivers that he’s not used to at the NFL level. Kris Durham could turn out to be a good NFL wide receiver, but he’s been thrown into the fire. Tight end Brandon Pettigrew’s absence also loomed huge. 2. The defensive line played without the injured Nick Fairley (shoulder) and Corey Williams is gone for the season. Sammie Hill and Ndamukong Suh haven’t worked side by side much this season but they have to do better. Until Sunday the Cardinals’ beat-up offensive line had allowed 51 sacks — nearly four a game. 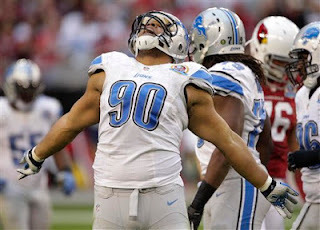 That should have been easy pickings and instead the Lions finished with just one late sack by Suh. 3. At some point you have to question whether the coaching staff had them prepared. Being out of the playoffs makes it more difficult but the Lions have to be mentally tough. They still have to get up for games and do everything to win. Were they up for the Cardinals challenge? They were hoping to mirror 2010 and win the final four games to go into the offseason on a bit of a good note. It’s going to be tough to win again this season with the Falcons at home on Saturday and the Bears at home on Dec. 30. Something went horribly wrong this season. It’s tough to pinpoint the reasons why. It’s not on one guy or one group. It’s been a team effort.